Each year airbus puts on a skiing weekend in Andorra for customers and since we are the Air NZ customers we got invited along. Even though a bus was provided we decided to drive, mainly so we could leave a bit earlier on Friday. We also did not know how the kids would go on a bus for four hours. We were very thankful of our decision as there was a detour due to an avalanche and the bus took almost five hours. It took us 3 and a half when it is normally about 3 by car. We arrived at the hotel at 8pm and checked into our lovely rooms. 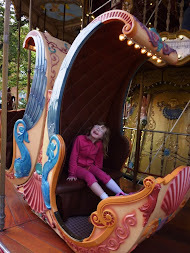 Even though our room was not adjoining the children's as we were at the end of the corridor it was fine. 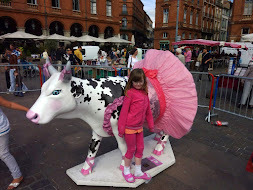 We went in search of a restaurant and found a medieval themed one just round the corner. 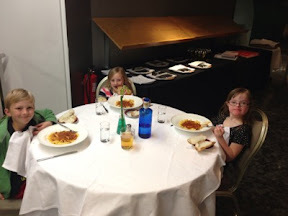 The food all came out very quickly so the kids were all tucked up in bed asleep by 10pm. We were due in the lobby to catch the bus at 8.30am the next day but because the others had not arrived till late then went for dinner the departure time was extended to 10am. 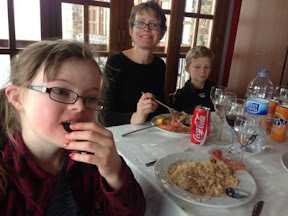 We eventually all got on the bus and headed for the Arcalis ski resort. After a slight detour (the driver went the wrong way and discovered it's very hard to turn around on a ski access road so had to keep going until he got to a turning bay) we finally arrived! We knew we could get lessons but we hadn't realised that airbus had hired ski instructors for everybody for the two days. 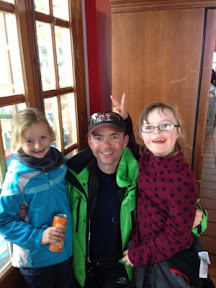 Our children were the only kids so Hannah and Penelope had a wonderful ski instructor called Remy all to themselves. He was so fantastic and James and him worked really hard with Hannah to overcome her fears. Hannah had found our last skiing experience quite difficult due to the blizzard conditions whereas this time it was sunny with no wind - perfect! Penelope on the magic carpet going up the slope. While James was settling the girls in I realised that the instructors were not just for the beginners but for all levels so I jumped into the intermediate group with Jasper and one other guy. We too had a great instructor, called Carlos, who focused on our technique. Jasper getting ready to ski. After lunch it was James turn for a ski so he joined an advanced group and had a great afternoon exploring the mountain with yet another fantastic instructor! I stayed with the girls and enjoyed seeing their progress. We finished just after 4pm to catch the bus back down the mountain. James and Jasper continuing skiing for another hour and got the second bus back. Dinner was scheduled for 9.30pm which was a bit late for our kids so an early dinner at 7.30 (yes that is early for the French!) was organised for them. James took them down while I got ready and I arrived in the restaurant just as they were finishing a big bowl of spaghetti sauce with GF penne pasta each. They were all full after a big dinner so we were all surprised when the waiter brought out their main course of homemade chips and a delicious chicken casserole! Luckily James and I were both a bit peckish so were able to help them finish it off. The hotel had organised a babysitter for us so she took them back to their room and put them to bed while we went to the hotel bar for cocktails. We had a lovely evening of socialising eating and drinking and James even had a bit of a dance - I went and relieved the babysitter as it was getting late. On Sunday we woke to a cloudy, snowy day and were unsure if we would be able to ski or not. We were heading to a different field called Pal and as it was only a 20 minute drive we decided to check it out and if it was too windy would just go back down to Andorra and go shopping. We took our own car up this time since the bus was heading straight back to Toulouse after skiing. It was snowing on the mountain but was not cold or windy so fine to ski. We found Remy and handed over the girls. He said we didn't need to stay with them so James, Jasper and I all headed off with Carlos. Pal is a huge resort and unlike skiing in NZ you just ski from one valley to another with chair lifts taking you from place to place. At one point we were on the border of Andorra and Spain. Luckily we had Carlos with us otherwise we would have got lost as the field is so large! The slopes near the resort were busy but once we got further away we were the only ones on the slopes which was fantastic. James and Jasper even did a bit of off piste skiing. They took me back to the girls after about two hours and then went off and did some skiing through the trees on the mountain bike tracks. A very happy Hannah after a days skiing. I arrived back at the learner slope to see Penelope and Hannah both skiing down the slope on their own. I felt so proud of them both but especially Hannah as she had overcome something that had been challenging for her. She was very proud of herself too which was just lovely to see. We then had lunch and said a huge thanks to Remy and Carlos and the wonderful airbus staff who had organised such a great weekend. We will definitely putting our names down for next year! A well deserved lunch after a busy morning skiing! 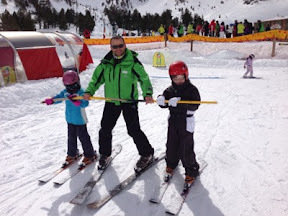 Posing for the camera with the fantastic ski instructor! 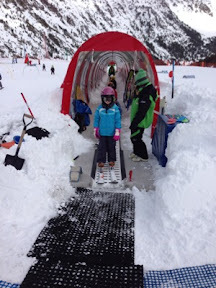 We have some videos of the kids skiing, so let me know if you won't to see them and I will send you the link. Loved the videos and blog. Well done to the kids. They all did so well. What a wonderful experience skiing through the trees and in the Pyrenees. What a charmer the ski instructor is. A great achivement for both girls after last time. Well done to the kids with their skiing. What a great experience skiing through the trees and in the Pyrenees. Hannah and Penelope did so well after last time. What a charmer the ski insturctor is. No wonder both girls acheived. Jasper is certainly progressing. The videos were great. We've been there in the summer and always vowed to come back. It looks idyllic with snow! What a great trip for you two!